For 11 days straight, we have been working in a makeshift sales office at Oceanside Terraces, the new luxury midrise residence in downtown Oceanside. The office consists of a small table, two plastic chairs and a 2-drawer filing cabinet. Cardboard is taped over the lobbys travertine floors, and we have to compete with workers for elevator space. Theres no coffee maker, no copier and even paperclips are in short supply. We think we are in heaven, because we are dealing with amazed guests and interested buyers all day long. Many step off the new Sprinter train next door, having come for a day trip from inland Escondido, Valley Center, San Marcos or Vista. They cant resist checking out Oceansides version of luxurious high rise living. Others come from Los Angeles, Orange County, North Dakota, Connecticut, Manhattan, Tucson, Las Vegas and Scottsdale and are no less amazed. They understand the significance of this six-story multi-use building with prime retail on the first floor, offices on the second, and residences and penthouses on the fourth through sixth floors. 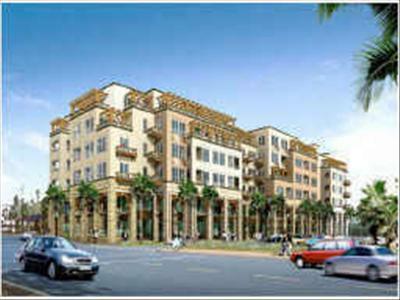 They know that downtown Oceanside is becoming a walkable community and is on its way to becoming a shining model for urban living. They also know they have 3.5 miles of great beaches, a balmy year round climate and some of the friendliest people in San Diego County. They want spacious single level homes large enough for guests, entertaining and long-term living. They want a walkable community that offers fine dining, shopping, museums and farmers markets. They want secure buildings, adequate covered parking and large lockable storage for bicycles, surfboards and other toys. They want to be close to public transportation. (How about a train and transit center on the adjacent block?). They want an easy train ride to downtown San Diego to see Padres games, San Diego Civic Center theater productions, or perhaps enjoy dinner or a day in San Diegos Old Town or Gaslamp District. The appeal of more distant travel also beckons as a possibility with Amtrak. And though it may surprise some of the real estate doomsayers and bubble bloggers, we are happy to report that the Oceanside Terraces are selling. So far this week, we have reservations from one Carlsbad and two Oceanside families. Others are returning for second and third visits. Oceanside Terraces offer floorplans that range from 1730 to almost 2600 square feet. Prices range from the high $600s to $1.7 million and many boast sparkling ocean views. We may not be able to offer you a cup of coffee, but please feel free to stop by 301 Mission (at the corner of Cleveland) and well happily show you what Oceanside Terraces has to offer. We are open 7 days a week from 11-4. And if you can remember, please bring a few paperclips with you. This stylish, Plan 3 three-story attached townhome at Vista Del Mar provides 4 beds + 4 Baths (with a ground floor bedroom/bath suite), and a generous rooftop deck to enjoy beautiful ocean views. Features include Quartz countertops, white shaker cabinetry throughout, a modern single basin kitchen sink, elegant Bertazzoni appliances, an upgraded electrical package and home automation system. This residence is in a coveted end unit location and is under construction with an est. delivery May/June 2019. Back on the market! Buyer could not perform! Motivated seller, priced to sell! VACATION RENTALS ALLOWED! Spectacular 3 story beach community home with Ocean patio view located one block from the beach! Great 3BR/3BA detached home offers an elevator so you don't have to climb stairs, central AC, vacuum system, granite counter tops, custom cabinetry, pantry, gated garage entrance, walk-in closets, and jetted tub. CC&Rs allow vacation rentals! Nicely landscaped front and side yards and wired sound system. Fire Mountain cul de sac home with canyon views and multiple outside entertaining areas. Large terraced yard with low upkeep plantings and artificial turf just installed. Great curb appeal with elegant paver driveway. Fresh interior with awesome natural light and open floor-plan. Twin masters with one down and large upper level master suite with deck could be separate entrance rental. Upgraded appliances, wood surface flooring in common areas. Optional office/library/media room with pool access. Sand and surf enthusiasts, prepare to fall in love with Tides by City Ventures. Just under 1 mile from sandy beaches and minutes from the marina, you’ll find flexible home designs crafted for dynamic living. A fusion of comfort and style, convenience and innovation, discover the best of beach and city living. Local, creative, and utterly refreshing, Tides invites you to bask in endless waterfront recreation and savor the joy of a carefree coastal lifestyle. Sales office is open 10am to 5pm daily. Seller will entertain offers from $859,000-$889,000. Looking for a buyer who wants it all! This stunning corner unit has panoramic ocean views from its very own roof top deck! Bells and whistles include private staircase access from the garage, over 1900 sqft and fully renovated with gorgeous finishes. Located west of the I-5 and in the heart of Downtown. Walk to the beach, library, theaters, restaurants and more... This condo is the cream of the crop! Last corner unit left in the entire building! No Butts on Oceanside Beaches? Pingback: A New San Diego Home for Artists? I had heard a lot of news about the oceanside community and it is pretty convincing living there. In the U.K., there is no requirement to show ID to an officer of the law, or even to give your name or address to such an officer, amtrak promotion code even if you are being searched under suspicion of having committing an offence. Based on information from California Regional Multiple Listing Service, Inc. as of April 23, 2019 22:40 and/or other sources. All data, including all measurements and calculations of area, is obtained from various sources and has not been, and will not be, verified by broker or MLS. All information should be independently reviewed and verified for accuracy. Properties may or may not be listed by the office/agent presenting the information.